It has been built on a strong technological platform that includes: our powerful rules engine, our intuitive and fully customizable form designer, our workflow and integration capabilities and our ability to automate the creation of data and of documents, automatically. 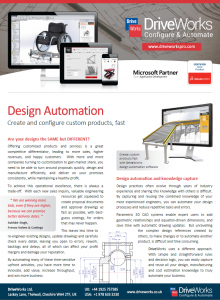 You can learn more about the underlying concepts that make up DriveWorks Design Automation and Sales Configurator software below. By capturing and reusing the combined knowledge of your most experienced engineers, you can automate your design processes and reduce repetitive tasks and errors. 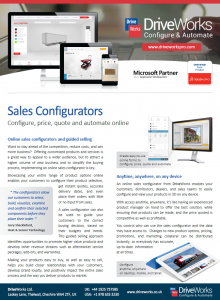 An online sales configurator created with DriveWorks software enables your sales teams, distributors, dealers and even customers to easily configure and view your products in 3D on any device. If you can define your knowledge and intent as rules, you can use the rules to make relevant decisions and perform actions in DriveWorks. When you use a configurator to specify what you want, the experience needs to be obvious and intuitive. Use a workflow to manage and define a task series of series of actions to produce a final outcome or outcomes. DriveWorks automates the 3D models and 2D drawings inside SOLIDWORKS 3D CAD. Respond to enquiries fast with great looking quotes and supporting docmentation that match your branding. DriveWorks Pro provides a number of different methods to make use of existing data within a company. DriveWorks has an out of the box integration to SOLIDWORKS EPDM to help you manage and organize the files created with DriveWorks. See how DriveWorks software is beneficial to real world companies, across many different industries offering configured products.